To achieve this, the partners plan a major investment in the professionalization of theatre makers on an international level. An extensive programme of interrelated activities will encourage transnational exchanges of artists/artistic products and provide training in digital technology through practice and international Creative Forums. In more than 50 activities it connects theatre makers directly with young people in a creative dialogue. 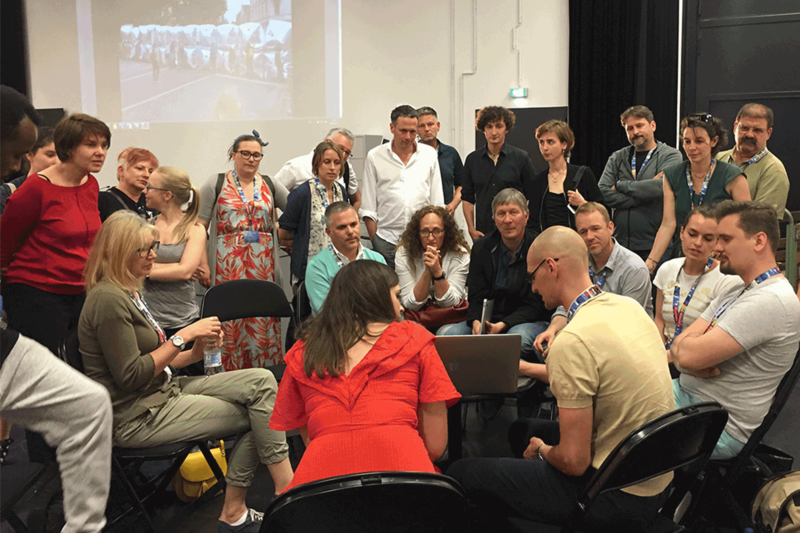 As results of the artistic exchange the network will develop 40 co-productions based on newly developed plays/concepts, correlated to the reality of the digital age within 4 years (2014 -18). The future is being constructed every day in the hands, minds and virtual activities of young people. Theatre can shift to be part of the world they build. It can provide the young people with unique artistic tools to examine and shape this world. The rich heritage of European theatre and its highly skilled pool of theatre makers can turn the challenges of the digital age into a powerful new beginning. PLATFORM shift+ is a larger scale cooperation project announced by the European Commission under their European Culture Funding Stream Creative Europe. It consists of 11 partners from nine countries – ten theatres and a university. The leading organisation, Pilot Theatre (York, UK), is one of the UK’s most renowned companies in delivering performance work for young people and exploring innovative approaches to making and sharing work. The project takes its title and inspiration from the shift+ key combination as the computer system gateway to advanced functions. The partners have identified the urgent need to engage fully with digital technology in order to understand the reality of the target audience – young people 14+. This international network was created to meet the new challenges of producing theatre for young people in the digital age. The majority of the partners were part of the internationally acclaimed theatre network PLATFORM 11 + Artistic Discoveries in European Schoolyards, 2009 -2013. Extensive research into the realities of young people aged 11+ was at the centre of this project and the potential for representing the complicated realities of their later teenage years was clear. The concept of PLATFORM shift + was born out of this. Today’s young people are able to move naturally between real and virtual worlds, further blurring the conceptual boundaries between the two. Theatre for them must respond to this new reality. Only by doing this can we accurately portray their reality and inspire them with a belief in theatre as a unique live medium for modern times. The confident belief of the partners, all experienced in working for and with young people, is that the future is the creative partnership between live performance and digital technology. PLATFORM shift+ plans a major investment in the professionalization of theatre makers in digital technology and young people’s participation on an international level. It proposes an extensive programme of interrelated activities consisting of huge public international conferences (Creative Forums), workshops and training opportunities, 40 (co-)productions based on newly developed plays/concepts, including transnational working processes and the touring of the artistic products. All professional artistic work is accompanied by young people’s projects under professional guidance. 1. Exploration and creation of audience development models through the use of digital technology. Stimulating improved interest by letting young people 14+ the main target group of PLATFORM shift+, participate in all network activities as co-creators and partners. 2. 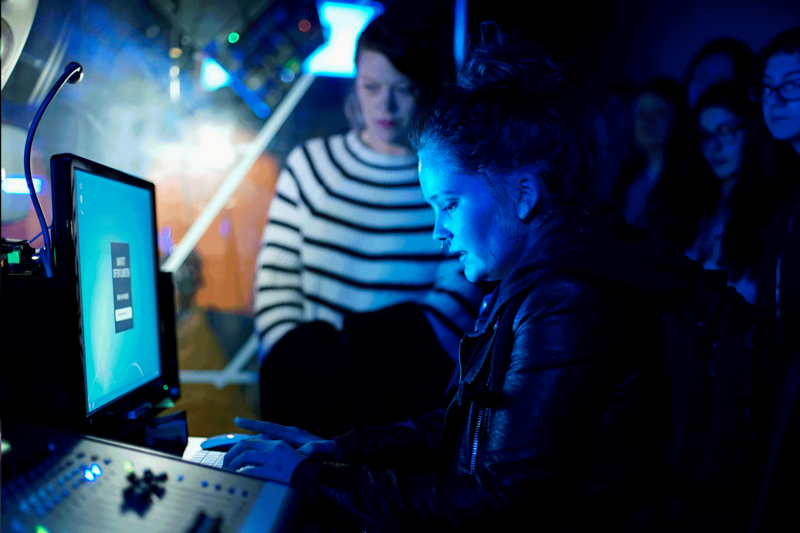 Access to high quality training in digital technologies for theatre artists, staff and young people; circulation of new thinking and methodologies. Practical application of newly gained knowledge to improve professionalism. 4. Facilitating transnational work and creative experience through co-working in real time and place and touring models in combination with innovative digital technology. This strengthens the partners internationally and provides the employees with new professional opportunities. 6. Active stimulation and promotion of digital technology in all areas of theatrical activity. Constant presentation of artistic results to the public in dedicated PLATFORM shift+ festivals, events and Youth Encounters. 7. Authorship of quality new theatre works (representing European literature) in transnational collaboration. All works are translated and published guaranteeing a wide accessibility. Theatre is an artistic medium that aims to shape the human debate and condition. In order to do this, theatre makers must continually examine the world to understand the changing realities. We are increasingly experiencing life on a global level as digital technology allows people to connect directly with cultural products from all over the world. Audiences now find more accessible, immediate and interactive engagement through the Internet and social media. They understand culture as the artistic products they can access on demand. This presents theatre with a major challenges of our times and those to come. The digital world is a reality. The merging of analogue and digital into a new model of human society demands immediate and radical action from theatre. The world has shift and theatre must shift too. This central truth is nowhere more important than in the field of theatre made for young people. Today’s young people are digital natives, who naturally inhabit the virtual world. The impact of digital technology influences the ways they communicate and how they expect to contribute to the world. The traditional model of theatre – a few people produce for a wide group of passive recipients – no longer matches the spirit of the times. New content and forms must be found. An aesthetic debate in theatre for young audiences has to be initiated. Digital technology is the reality of modern life, but also a powerful tool we can use to renew theatre. Young people are ready to play an active role in the creation and dissemination of theatre products. The young digital natives now expect an active, co-operative role in the creation and delivery of artistic products. They should be treated as co-creators and advisors. By working together in true partnership we can encourage them to see theatre as a powerful channel for their voices, ideas, hopes and fears in both the real and virtual worlds. The key to change is real acknowledgement and deeper understanding of how the digital world operates. We need to know how young people use it and the influence it has on their behaviour and thinking. We need to explore how it can be used to meet theatre’s objectives. And we need to keep the unique nature of theatre as a live medium in the digital age. As real and virtual worlds became one reality for the young, theatre must, can and finally will shift. The challenges facing theatre for young people in the digital age will provide opportunities for audience development and engagement, artist professionalization, artistic exploration and the creation of ground-breaking new work. Our main goal is audience development. It is in the nature of theatres working for young people to always think about attracting the next generation. Young people grow up and are replaced by others who experience a changing world in different ways. To sustain a young audience means constantly to find ways to attract a new audience. At every stage of the project, the main focus for delivering these 3 elements of professionalization is the creation of artistic products.